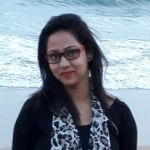 Susmita Maitra from Naihati, B.Sc Graduate. Susmita Maitra is Graphic Designer /Creative Designer and currently have no work experience. ADOBE PHOTOSHOP COREL DRAW ADOBE ILLUSTRATOR CS.. 3DS MAX ADOBE AFTER EFFECTS .. ADOBE PREMIER PRO ADOBE FLASH ARTRAGE MS WORD MS POWERPOINT AND WO..
are one of expert skill area's of Susmita Maitra . Susmita Maitra is working in Others industry.